The Compendium is author, Brian Corvin's third published work. Where his first two – The Dream Journey (2010) and The Unity Project (2016) – were collections of poetry and verse, the present volume offers "something a little different". The opening section contains of a selection of neohaikus and social verse while, the second introduces the reader to some quirky short stories, taking on tales of the macabre, turning up some strange and unexpected twists. This is followed by a trilogy of related one-act plays that deal with the issue of clerical child abuse, probing the question of whether forgiveness of the kind that can lead to redemption is ever really possible in such a context. The volume finishes with an autobiographical fragment (Towards a New World Order), in which he describes how he became a Baha'i, while living in Devon, England back in the 1960s. "I am still a Bahai though, these days, I sometimes describe myself as a Neo-Bahai. I have never regretted my move to Bahai though, when writing about it, I sometimes feel that I can see similarities to Graham Greene's sardonically tinged attitude to Catholic beliefs and practices. I still believe that Bahai offers an unmatched vision for the future of the species, though we seldom live up to its aspirations and, I certainly feel that it is worth considering in this confusing, pessimistic and negative transitionary period." The author, Brian Corvin, was born in Dublin, Ireland eighty years ago but, he sees himself as a world citizen. He has been inspired by Bahaullah, the prophet of globalisation but, feels that his writing should be grounded in the here and now of the world that he finds around him. He achieves this quite admirably and with keen insight. His true talent, it might be said, rests in an ability to faithfully convey the views held by those of a particular mindset, irrespective of whether one might share those views or, even sympathise with them. It comes across in his writing whether he is talking about the European refugee crisis, politics in the era of Trump, the motives that drive people to commit desperate acts. 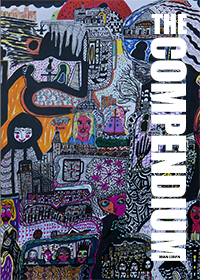 The Compendium by Brian Corvin is published by The Manuscript Publisher. It is on sale now and available to buy online as well as from certain bookshops. RRP €9.99.